This package can generate and validate submitted HTML forms. It provides several classes that abstract each type of form field and can create form field objects that can be composed to generate the form output. The package provides also means to filter and validate the submitted form input values. 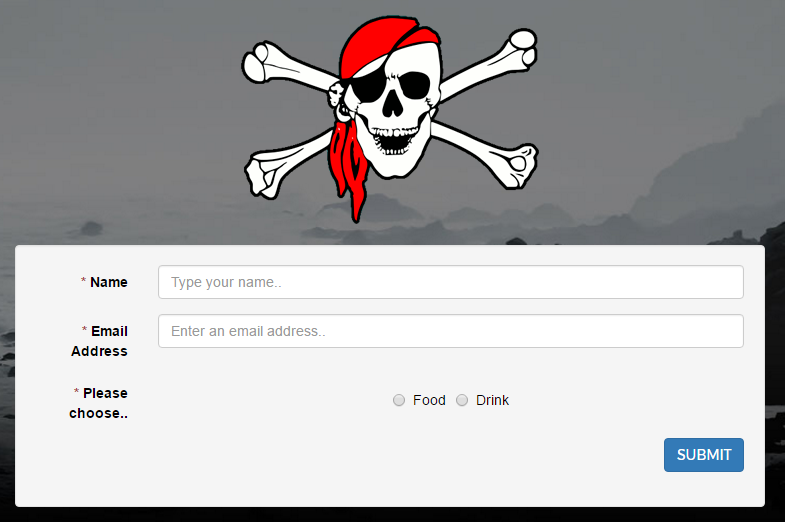 The form output can be rendered using bootstrap CSS styles. v1.1.0 Now has 'Dynamic Form' functionality. You can add child forms to fields like radio buttons, and have the form appear on selecting the trigger value. See the Dynamic Form section of this readme. Firstly, "use" all the classes you'll need for your form. Then create your form and fields. // Create a username, email, spamlist checkbox, and submit button. For filtering input, add a Del\Form\Filter\Interface to your field object. For validating the filtered input, add a Del\Form\Validator\ValidatorInterface. Currently there is an adapter for Zend\Filter and Zend\Validate, but feel free to write an adapter for you favourite library. Setting a required field adds a Del\Form\Validator\NotEmpty validator. Del\Form\FormInterface has a populate method which takes an array (usually the post data, but not necessarily ;-). After populate has been called, if you call Form::render(), it will display any validation error messages. Del\Form\Field\Text fields are the most basic field, and come with a built in StripTags and StringTrim filter. Del\Form\Field\Text\EmailAddress extends Text, and adds an EmailAddress validator for convenience. Del\Form\Field\Text\Password is a password field which also extends Text. You can have for example a radio button with two choices, and each choice can have a separate form relevant to the checked value. For instance, a radio with a choice of food or drink could then display a dynamic form upon clicking the drink option, and the drinks form will display.